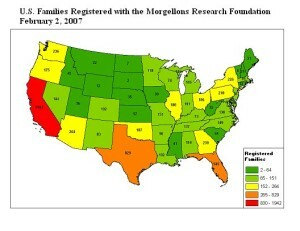 The Morgellons Research Foundation (MRF) - Morgellons Disease ? 1. What is Morgellons disease? ........... ......2. Where did the name "Morgellons" come from? 3. What is it like to have Morgellons disease? 4. What is the source of the skin lesions and fibers? 5. Could this be bio-terrorism? 6. Is there a cure? 7. Does anyone care? 8. What is the treatment? 9. Who suffers from Morgellons disease? 10. How is the CDC responding to this crisis? 11. How are physicians responding to this crisis? 12. How can I help? 13. How can I receive the latest news and developments in research? Symptoms These structures can be described as fiber-like or filamentous, and are the most striking feature of this disease. In addition, patients report the presence of seed-like granules and black speck-like material associated with their skin. 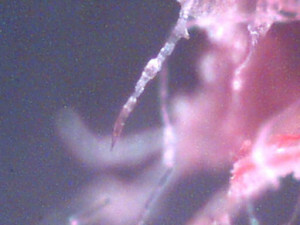 Fig 1. and Fig 2. below show Fibers emerging from a lesion on child's lip at 200x. The Morgellons Research Foundation (MRF) has received registrations from people reporting this condition from all fifty U.S. states. The MRF has also received registrations from people reporting this condition from 45 other countries, most notably Canada, Australia, England, South Africa and the Netherlands.